NTP clocks synchronize using the Network Time Protocol (NTP) over an Ethernet network to provide an consistently accurate time display. The clocks can obtain time from an internet based or local NTP server or NTP master clock. Additionally, the SNTP protocol can also be used. Network clocks are entirely maintenance-free, daylight saving changes are completely automatic. Step Global also provides PTP Grand Master clock solutions for specific commercial and inductrial applications (Please contact us directly for more information on PTP timing solutions). NTP clocks provide an accurate display of time by synchronizing to a local or internet based NTP or SNTP network time server. Clocks have RJ45 network sockets for standard CAT5 or better network cable. By using configurable time and DST settings, the clocks can display UTC or local time. Daylight saving offset adjustments are completely automatic, no operator intervention is required. NTP clocks provide an accurate, synchronized, time display organization-wide. They provide a legally traceable time reference for logging events. Classes and meetings start at the correct scheduled time. 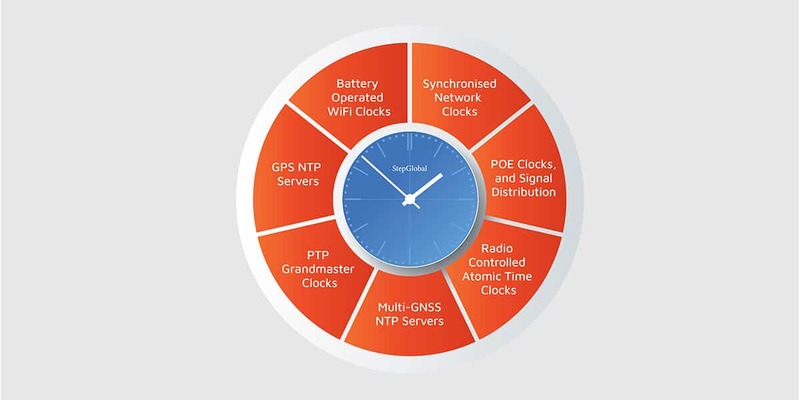 No expensive master clock is required – NTP clocks can synchronize to a local or internet NTP server. Clock systems are maintenance free, no operator intervention is required for daylight saving time changes. All clocks can be managed from a single point. Time zones can be configured individually to show the time in other countries. Power-over-Ethernet (PoE) allows both data and power to be provided over a single CAT5 or better network cable. PoE clocks can be powered from the network cable without the need for a separate power supply or electrical socket near the clocks location. Additionally, our PoE clocks comply with industry standard IEEE 802.3af PoE. They can be installed on existing networks with the simple addition of a PoE injector. PoE clocks synchronize to a local or internet NTP or SNTP time server to provide an accurate time display. Clocks have configurable time zone and daylight saving settings. Time offset changes for daylight saving are completely automatic, requiring no operator intervention. Clocks comply with industry standard IEEE 802.3af PoE and can be installed on existing networks. PoE reduces installation costs – both power and data is provided over a single CAT5 (or better) Ethernet cable. Clocks can be installed without the need for a separate power supply. Cost savings as expensive electrical outlets are not required near the powered device. Wi-Fi or Wireless clocks are battery operated and portable, and use existing Wi-Fi network infrastructure to receive the time signal, rather than a signal from a master clock. This means there is no need for a system controller, license fees, managed services or other costs. Wi-Fi clocks arrive preconfigured and automatically adjust to the correct time. They will continue displaying the accurate time without manual adjustments of any kind.